Cream eyeshadows have long been a favorite of mine. I remember slicking on shade after shade of cream shadow from Bath & Body Works circa 1999 before going out for the evening -- sometimes smudging it all the way up to my browbone in the hopes of looking uber-cool. (I'm not sure I ever succeeded.) 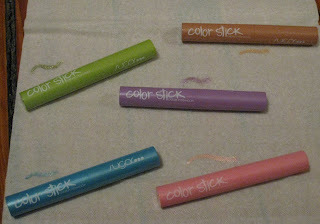 Luckily I've been given a second chance with cream shadow, this time in the way of the Sugar Cosmetics Color Sticks. Five absolutely glorious shades are available to play with, each one more glittery and shimmery than the next! Each slicks on with the greatest of ease and holds up amazingly well. This beauty chick actually even went to sleep with them on and woke up with them still intact! The five deliciously delightful shades are Grape Soda (glittery lavender), Pink Fizz (shimmery rose), Blue Pop (intense turquoise), Apple Cider (glistening taupe) and Limeade (sparkling olive). Those colors look so fun! I think I need the Blue Pop and the Limeade for sure!